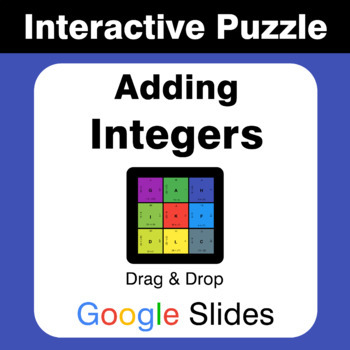 Three Math Interactive Puzzles (Drag & Drop) with Google Slides®. Math Matching Puzzles are an exciting and engaging way for your students to practice a variety of concepts while developing their critical thinking and problem solving skills. - Students need to Drag & Drop all 9 puzzle pieces onto a grid so that they make up a 3 x 3 square. - Some questions will not have a matching solution - these are the edge pieces. 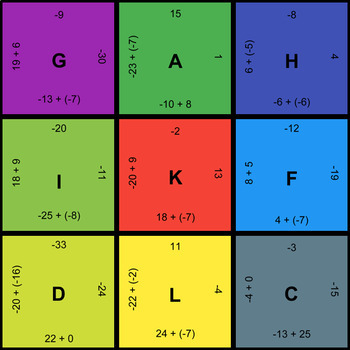 - You can quickly check students answers by comparing the letters in the middle of each puzzle piece to the answer key provided. This product contains a pdf with the link to access your puzzles. You can purchase ALL INTEGERS Interactive Puzzles bundled into one large set to save your money!